Troy Homes has acquired a 2.7 acre (1.09 hectare) development site in Royston, Hertfordshire. Located in Garden Walk in a mature residential area of the town, the site is around a half mile from the town centre and station. Its former land use, as a farm machinery retailer, had become out of character for the area and the site already has an outline planning permission for residential development. Troy will improve on this existing permission with proposals to develop a total of 19 houses with three, four and five bedrooms. The houses are both semi-detached and detached to cater for a wide variety of buyers. All will have garages and good sized gardens and will be based on the designs already successful at the company’s popular Laburnum Gardens development in Hitchin. Royston Leisure Centre is nearby; there is excellent road access to the A505 and the A10 and Royston station is less than a 15 minutes walk away. 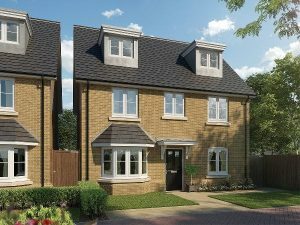 The site will provide outstanding homes for families looking for convenient market town living. The acquisition follows the successful launch and good forward sales at the company’s Hitchin and Beauchamp Roding, Essex sites and co-incides with building work starting on new sites at Farnham Royal, Berks and Friern Barnet in North London.